Petgill Lake is a terrific day-hike in Squamish off the Sea to Sky Highway, near Murrin Provincial Park. Petgill Lake is a small, scenic lake, perfect for a summertime dip. Just beyond the lake awaits a lookout over Howe Sound down below. While the view isn’t as dramatic as The Chief or Tunnel Bluffs, it is still awe-inspiring. The only complaint of this hike is that a portion of the trail is along an old logging road. The logging road section of the trail is not the most exciting hiking. Regardless of the logging road, the rest of the hike provides a good challenge, beautiful forest, and a rewarding view at the top. 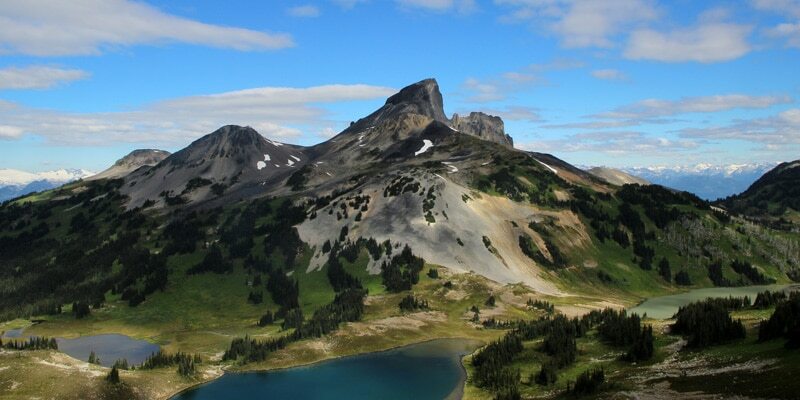 At 770 meters maximum elevation, Petgill Lake is a gem of a hike to save for the shoulder seasons. From the Murrin Provincial Park parking lot, you will need to carefully cross the Sea to Sky Highway. Crossing the highway is dangerous, and should not be taken lightly. Wait for a large gap in traffic from both directions. Once across, walk north up the side of the highway, towards Squamish, for a few hundred meters. On your right, you will find the trailhead marked by a faded, wooden sign that reads ‘Petgill Lake’. The trail will immediately begin climbing up into the forest. The first 100 meters are steep and technical. Footing is difficult in sections during this beginning stretch of trail. There are plenty of rocks and roots and the trail is somewhat overgrown. After the initial difficult section, the trail continues climbing uphill. The footing becomes easier, and the trail is less overgrown. In this section along the Petgill Lake Trail, there is plenty of orange flagging in the trees to help keep you on track. In fact, the entire route is well marked with orange flagging, square markers, and spray paint. Over the next 150 meters, the trail will continue to zig-zag uphill. The trail here is challenging, with some light scrambling. You will be able to see and hear the highway down to your left. About 350 meters into the hike, the trail turns into the woods, away from the highway. This part of the trail is well-groomed and easy to follow but continues at a steady uphill grade. Settle into the climb at a comfortable pace. There will be very few downhill sections to rest your legs before reaching Petgill Lake. Continue to follow the orange markers. Roughly 800 meters in, there will be a couple switchbacks into the forest, further away from the highway. You will continue climbing with a large rock wall on your left. At the 1.3-kilometer mark, or about 30 minutes in, there is a viewpoint if you pay attention. The viewpoint is just off to the left of the trail. This viewpoint overlooks The Chief, Squamish Estuary and Mount Garibaldi. An early view towards Squamish. Carry on the trail from the viewpoint. 5 to 10 minutes after the viewpoint, the trail zigs up and down and will push you out onto a gravel logging road. Go right on the logging road, heading uphill. This is about 1.6 kilometers or about 50 minutes into the hike. A few trees on the side of the road will have orange spray paint on their trunks. There may also be large arrows created with branches to help you stay on track. After about 15 minutes of walking along the road, you’ll cross a small stream, that may not be flowing later in the summer. You will come to a junction in the road. Be sure to go right. There may be some cairns to help you. This junction is about 2.9 kilometers or 1 hour, 15 minutes into the hike. The road narrows but continues climbing uphill. You will continue walking up this road for about half an hour before picking up the trail again. 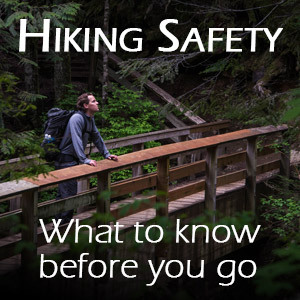 Pay attention, as the trail is on your left, off the side of the road. There should be some large sticks laid across the road here. You will also see yellow flagging in the trees and an orange tree-marker to mark the trail. But it can be easy to miss the trail and keep walking along the road. This junction is about 3.6 kilometers into the hike. The Petgill Lake Trail becomes single-track again and begins climbing sharply. This section is rooty but easy to follow. The trail will continue climbing. There will be a few parts where you may just want to make sure you’re on track, but there are plenty of orange markers. You should almost always be within sight of one. Just keeping grinding uphill. You will cover a series of ups and downs, including crossing a large ravine and passing through some boulders. At about 2 hours, or 4.6 km, you will come out to an exposed outcrop. You are nearly at Petgill Lake. At 5.5 km, and a little over 2 hours of hiking, you will come to a junction. There is a faded sign on a tree which indicates the trail is for Goat Ridge (an additional 2 hours from here). Stay left, in the direction marked for Petgill Lake. After ten more minutes, you’ll come out to an exposed outcrop which provides an obstructed view of Petgill Lake below. Follow the trail and it will drop down. Before checking out the lake, carry on ten more minutes to the Petgill Lake viewpoint over Howe Sound. To get there, follow the trail left, uphill yet again. It’s a steep climb, but it is short and well worth it. From the viewpoint, you have great views of Howe Sound. This is a great spot to have lunch, as there is more space and better scenery here than at Petgill Lake itself. From the lookout, you can see Howe Sound and the Tantalus mountain range. When ready, drop back down the trail towards Petgill Lake. This time, find the trail that emerges onto the lake. There isn’t an open beach area to get into the lake for swimming. But there is one area which has been cleared out, where you will find a small access point. Petgill Lake is beautiful. It can be cold but makes a great spot for a swim. After you’ve swum or simply enjoyed the scenic Petgill lake, retrace your steps back to your car. Parking for the Petgill Lake hike is in the Murrin Provincial Park parking lot. The parking lot is off the Sea to Sky Highway, by Browning Lake. The park gates are open from 7am until 10pm. During the summer, the parking lot can get very busy. Cars not parked in designated parking areas are subject to towing. To get to the parking lot, take the Sea to Sky Highway, north, towards Squamish. The turnout is a few minutes beyond Britannia Beach (Britannia Mine Museum). You will see the signs for Murrin Provincial Park and you will also see Browning Lake on your left. There is a left-turn lane you can pull into, to safely make the turn into the parking lot. If you reach Shannon Falls, you have gone too far and must turn around. Petgill Lake is a nice hike for the shoulder season. It sits at a lower elevation, usually below the snow line, but still provides a great view from the summit. In the summer months, it’s a nice spot for a swim.